Wigglytuff in game: 461 Who? Important notice! Pokemon Wigglytuff is a fictional character of humans. Wigglytuff (Japanese: プクリン Pukurin) is a dual-type Normal/Fairy Pokémon introduced in Generation I. Prior to Generation VI, it was a pure Normal-type Pokémon. It evolves from Jigglypuff when exposed to a Moon Stone. It is the final form of Igglybuff. 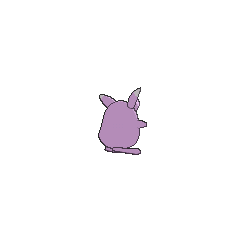 Wigglytuff resembles a pink blob with stubby arms and legs. There is a fluffy, curled tuft of fur on its head, and it has long, rabbit-like ears and large, blue eyes. A layer of tears covers its eyes, quickly washing away any debris. It is covered in pink fur with a white underbelly and ear tips. This fine layer of fur is so soft that those who touch it, including other Wigglytuff, will not want to stop. Its body is soft and rubbery, allowing it to inflate by inhaling. While it is inflated, it is able to move by bouncing or floating. Wigglytuff can be found in vivid green plains and grassy fields. Some Wigglytuff love eating Perfect Apples, as shown in Pokémon Mystery Dungeon: Explorers of Time and Explorers of Darkness. Guildmaster Wigglytuff makes an appearance in the Pokémon Mystery Dungeon: Explorers of Time & Darkness special. He assigns a mission to save Shinx's brother to Team PokéPals. Wigglytuff also happens to be able to fall asleep with his eyes open. He reappeared in Pokémon Mystery Dungeon: Explorers of Sky - Beyond Time & Darkness alongside his guild during the time freeze. Wigglytuff made an appearance in A Battle of Aerial Mobility!. Nurse Joys of Kalos are using Wigglytuff instead of Chansey and Audino as nurses. In Lights, Camera, Quacktion!, Cleavon Schpielbunk was going to have a Wigglytuff have the starring role in his movie, "Pokémon in Love", alongside Misty's Psyduck. In Mewtwo Strikes Back, a Wigglytuff owned by Neesha was one of the Pokémon that was captured and cloned by Mewtwo. The Wigglytuff clone was seen again in Mewtwo Returns. Harley was revealed to own a Wigglytuff in Thinning the Hoard!, where he used it along with Cacturne in a two-on-two Contest Battle against May's Munchlax and Eevee in the Kanto Grand Festival. Unlike most Wigglytuff, Harley's Wigglytuff wears a rather sinister expression, possibly reflecting its Trainer. 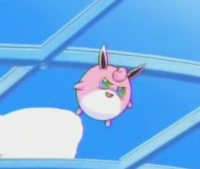 Wigglytuff also appeared in The Power of One. A Wigglytuff was one of the Pokémon seen at the Pokémon Swap Meet in Tricks of the Trade. A Wigglytuff appeared in Beauty and the Breeder where it participated in a Pokémon breeding competition. A Wigglytuff under the ownership of an unnamed Trainer battled in a qualifying match for the Silver Conference in A Claim to Flame!. A Wigglytuff belonging to a Coordinator was used in the Fallarbor Contest in Pros and Con Artists!. A Trainer's Wigglytuff appeared in SS027. A Wigglytuff appeared in SS028. A Wigglytuff made a cameo appearance in Kalos, Where Dreams and Adventures Begin! and Lumiose City Pursuit!. A Wigglytuff appeared in the book Bonnie was reading in The Clumsy Crier Quiets the Chaos!. A Trainer's Wigglytuff appeared in Thawing an Icy Panic!. Multiple Wigglytuff that were each under the ownership of a Nurse Joy appeared during a flashback in A Giga Battle with Mega Results!. A Wigglytuff appeared in Till We Compete Again!, where it was on a video screen in the Lumiose City airport. A Lass with a Wigglytuff appeared File 3: Giovanni. A Wigglytuff is one of the many recurring characters in the manga Magical Pokémon Journey. She lives in a mansion with her younger sister, Jigglypuff, and her butler, Squirtle. In Even an Arbok Falls in Love!, Arbok confesses his love to her and she becomes his girlfriend. Wigglytuff debuted in Punching Poliwrath where it was having a checkup from Daisy Oak. 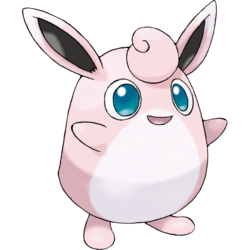 A Wigglytuff is owned by Green, the evolved form of her first Pokémon, a Jigglypuff. After having been in her initial stage since before her first appearance, Green evolved her alongside her Nidorina and Snubbull in Give It Your Best, Blastoise to provide support for Blasty's powered-up Hydro Cannonattack. A Wigglytuff was one of the Pokémon sent to help the fight in Ilex Forest in The Last Battle XIII. Pokémon Mystery Dungeon: Wigglytuff sells Friend Areas in Pokémon Square. 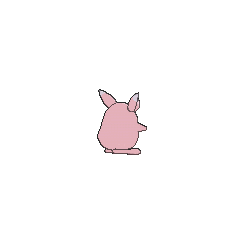 Pokémon Mystery Dungeon: Explorers of Time and Explorers of Darkness and Explorers of Sky: Wigglytuff is the head of the main guild in Treasure Town. His personality tends to be erratic, but he cares about all his friends in the guild, especially his close partner Chatot. He also has a love (some would say obsession) of Perfect Apples, and is basically all he eats. He can often be seen bouncing one off his head during dinner. He is described as peculiar and weird in the game, although he is exceptionally strong, defeating the whole of Team Skull and Kabutops and the Omastar Brothers, as well as numerous others, with ease. Chatot warns not to annoy or disrespect Wigglytuff, as he is liable to explode with anger. Its soft and supple skin allows it to expand like a balloon. If it gets angry, it inhales and inflates itself steadily. 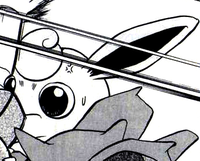 Wigglytuff has large, saucerlike eyes. The surfaces of its eyes are always covered with a thin layer of tears. If any dust gets in this Pokémon's eyes, it is quickly washed away. Wigglytuff's body is very flexible. By inhaling deeply, this Pokémon can inflate itself seemingly without end. Once inflated, Wigglytuff bounces along lightly like a balloon. Moves marked with a superscript game abbreviation can only be bred onto Wigglytuff in that game. 51%-100% HP This fur you see is of the highest grade! 26%-50% HP Umm... I only have about half my HP left. Level up There we go! I leveled up! I can work harder! It attacks by singing to send out musical notes. It also jumps to compose shock waves. 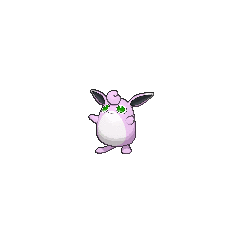 For other sprites and images, please see Wigglytuff images on the Bulbagarden Archives. Wigglytuff and its evolutionary relatives share their category name with Qwilfish and Drifloon. They are all known as the Balloon Pokémon. Wigglytuff has the highest base HP of all Fairy-type Pokémon. 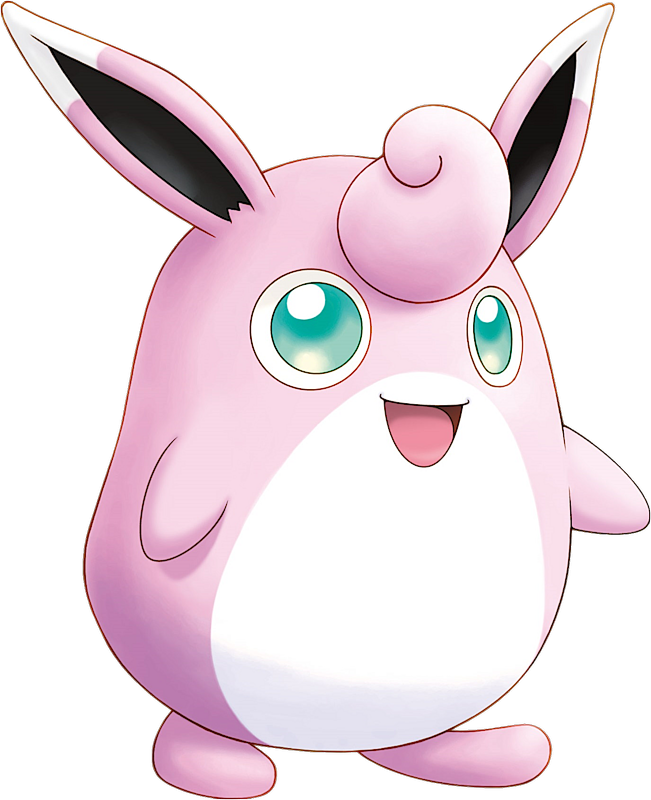 In its earlier appearances, Wigglytuff's white stomach did not always extend above its mouth; however, it always does this in modern appearances. Wigglytuff appears to be based on a balloon. Its ears resemble that of a rabbit. 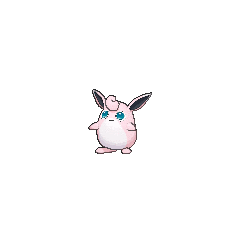 Wigglytuff's name is a combination of wiggly and tuff, referring to its wobbly shape and either its toughness or the tuft of hair on its head. Pukurin may be from ぷりぷり puripuri (in a huff) and くりくり kurikuri (big and round), or from ぷくぷく pukupuku (cute and chubby; puffed up). It may also be a corruption of プリン purin (pudding), as well as a combination of 風船 fūsen (balloon) and 膨れる fukureru (to expand or inflate). Japanese プクリン Pukurin ぷりぷり puripuri and くりくり kurikuri. It may also be a corruption of プリン purin, as well as a combination of 風船 fūsen and 膨れる fukureru.